I wasn't planning on joining anything in 2012, and if I did, it wouldn't be many. Considering 2011 was a bust of everything I had such high hopes for, the idea of participating in 2012 was unnerving. But... I'm feeling pretty invincible after finishing Wolf Hall last night. When I read that Carl at Stainless Steel Droppings was hosting a Science Fiction Experience from January 1, 2012 to February 29, 2012, and NOT a challenge, I was nervous, yet intrigued. Carl also hosts the RIP Challenge, which 2011 was my first time joining. This helped me realize I do better with shorter events than year-long ones. I've only put a toe in the water for Science Fiction in the past, so I figured, why not? It couldn't hurt. Besides, I have these books from George R.R. Martin that I'm eager to try. So I'm ready to jump into the fray. As Carl writes in his intro, there are no rules. Just have fun. It's not a challenge, and it also encompasses both reading and television participation. I think I might be ready. What about you? I'm thinking about officially joining in. I used to read a lot of scifi but now not so much, and I kinda miss it. 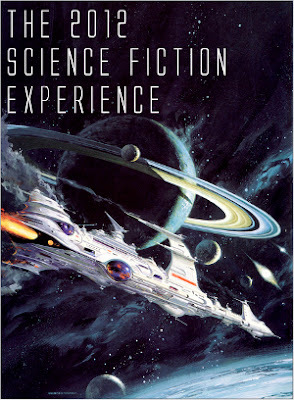 I haven't read or watched a lot of Science Fiction, but I am intrigued by this experience, as you call it. I am off to find out a little bit more about it now. Thanks for letting us know! I'm going to read for this one too, Natalie! It's been years since I really put any time into SciFi, so I think it's time to try it again! Oh I'm so looking forward to this. I've joined in before and have been collecting books this year to save for this. Yay!